This entry is our analysis of a study considered particularly relevant to improving outcomes from drug or alcohol interventions in the UK. The original study was not published by Findings; click Title to order a copy. Links to other documents. Hover over for notes. Click to highlight passage referred to. Unfold extra text The Summary conveys the findings and views expressed in the study. Chafetz M.E., Blane H.T., Hill M.J. eds. New York: Science House, 1970. Later to become founding director of the US National Institute on Alcohol Abuse and Alcoholism, in the late 1950s Dr Morris Chafetz of the Massachusetts General Hospital conducted a remarkable series of studies which proved that an alcohol clinic's intake and performance can be transformed by the simple application of empathy and organisation. Summary This account is adapted from the Findings review The power of the welcoming reminder. Apart from the featured book, it drew on the preceding journal articles dealing with the impacts of the 'treatment catalyst' teams and the doctor's tone of voice, and the chapter "Increasing motivation for change" in the 1995 edition of the Handbook of alcoholism treatment approaches. Much of what we know today about how to engage dependent drinkers in treatment was prefigured in a remarkable series of studies begun in the late 1950s at the alcohol clinic of Massachusetts General Hospital. It was run by Morris Chafetz, later to become founding director of the US National Institute on Alcohol Abuse and Alcoholism. Dr Chafetz showed that not only can a service's performance be improved, it can be transformed by the simple application of empathy and organisation. He suspected that alcoholics' notoriously poor acceptance of and response to treatment reflected the dismissive or hostile attitudes of those around them, including clinical staff. If these attitudes were replaced with optimism and respect, then many more patients might embrace the help they needed – exactly what happened. ‘Skid-row’ alcoholics seen at the emergency department were in crisis, dirty, disturbed and disturbing, and refused treatment. The effect was to evoke hostility and rejection. Work started with the observation that virtually none of the alcoholics referred to the clinic from the hospital's emergency service actually attended. A micro-analysis of the referral process revealed that it entailed seeing perhaps a dozen individuals and numerous delays and opportunities to be baulked by the system. Staff attitudes did not engender determination to overcome the obstacles. 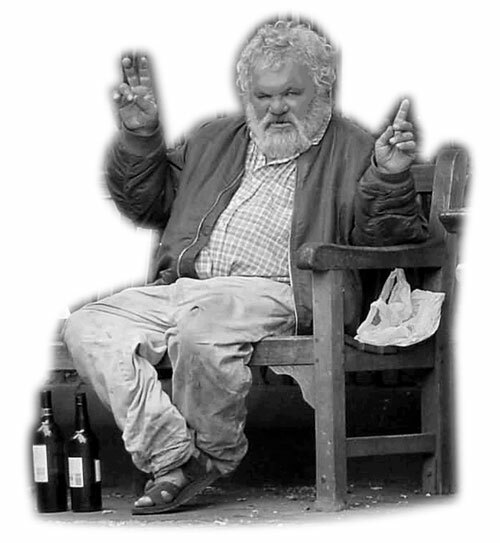 Typically these 'Skid Row' alcoholics were in crisis (the reason for emergency admission), dirty, disturbed and disturbing, and often dragged in by the police. The effect was to evoke outright hostility and rejection on top of underlying moralising and punitive attitudes. Chafetz's team set out to create instead a welcoming and seamless procedure which established the emergency episode as the start of rehabilitation. It involved not just directly interfacing with the patient, but networking to gain the cooperation of other hospital staff and of outside welfare and housing services. Effectively Chafetz pioneered a case management approach intended to see that the alcoholic got coordinated, holistic and continuing care. In practice they established 'treatment catalyst' teams to reach out from the alcohol clinic: a psychiatrist on 24-hour call to immediately see patients in the emergency room, and a social worker who worked with the patient, their family and outside services. By being welcoming, respectful and concerned and by continuing to care for the patient throughout, they sought to convey that they were the patient's own personal doctor and social worker. They also tried to avoid the patient being treated poorly by other staff. Rather than the insight-oriented psychotherapy then in vogue, they stressed practical actions responsive to the patient's expressed needs, such as help with housing, money, getting a meal and a shave. ‘Treatment catalyst’ teams transformed clinic attendance. Alternate male alcoholic patients were assigned either to normal emergency procedures or additionally to one of the treatment teams, 100 in each group. 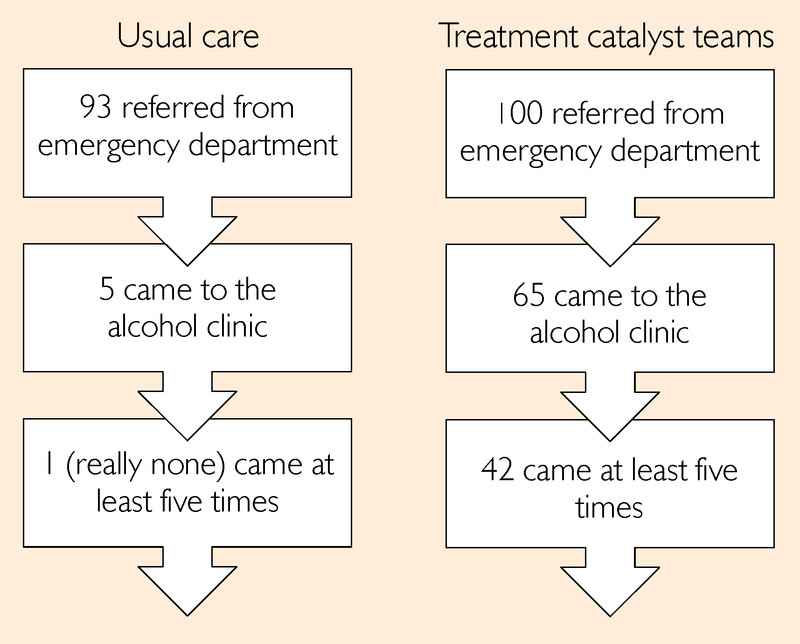 Nearly two-thirds (65%) of the treatment catalyst patients made an initial visit to the alcohol clinic compared to 5% of normal procedure patients. Forty-two of the patients seen by the teams made five or more visits compared to just one of the normal procedure patients – and he was a former clinic patient. The supposedly insoluble problem of engaging these "alienated men" was exposed as due not to their intractability, In a later study the alcoholic clinic's psychiatrists took on the screening role at the emergency service. The result was to identify and refer to the clinic a less socially isolated group of patients, but they too attended far more often if the catalyst teams started the process in the emergency department: 62% made an initial visit versus 21%; 27% versus none made five or more visits. but to that of an inappropriate clinical response. In a crisis, respond – simple! Another way the clinic came in contact with potential patients was through phone calls from the alcoholic or their family, usually during a domestic crisis. The response was typical of services then and perhaps of many now. A secretary noted basic details then mailed out an appointment for several weeks hence, by which time the moment and the motivation had passed. Instead Chafetz's team tried initiating same-day social work contact with the family, if necessary in person at the their home. After assessment, therapy and practical intervention were made immediately available. Throughout, the same social worker maintained contact. On a quasi-random basis, callers were allocated to this approach or to normal procedures. Initial attendance tripled from 21% to 62% of patients and from 13% to 38% of their relatives. In nearly 30% of cases both came together compared to none under normal procedures. None of the usual-procedure patients returned at least five times over the next six months compared to 27% of the immediate-response patients. Patients were now coming for intake but still many did not return, particularly those (the most inebriated and debilitated) who after assessment had first to be sent to an inpatient unit to 'dry out'. The clinic's first attempt to retrieve them was a handwritten letter sent the day after their assessment. It expressed personalised concern ('I am concerned about you.') and equally personalised desire that the individual would return, when the service would be "glad to work with you". It was sent to 50 randomly selected patients; another 50 were handled as usual. The impact was striking: 25 returned, all but five sober, and 19 the day they were discharged from the unit; without the letter, 16 returned, just two without delay and most after having resumed drinking chart. Replacing the letter with a phone call to the unit had a similar impact. Within a week of discharge, 22 of the 50 called patients returned for outpatient care but just four of the 50 who were not called. The next experiment was based on the belief that alcoholics are sensitised to hints of rejection in what a doctor says and how they say it. The doctors concerned were nine of the emergency doctors involved the year before in the earlier studies. The issue was whether emotion betrayed months later in response to the question, "What has been your experience with alcoholics?" would predict how many of their patients had followed through on a referral to the alcohol clinic. Ratings were made of the unaltered tape recording, of one filtered to obscure the words but leave emotional tone, and of a transcript. As expected, ratings were related to referral success only when the treatment catalyst teams had not intervened to override the doctors' influence. Also not unexpectedly (all the patients had been men), the only significant relationships derived from male raters. The more anxious the doctor sounded and (in filtered speech) the less angry, the more of their referrals had been successful. The correlations were substantial and statistically significant. Just missing significance was a trend for more matter-of-fact and 'professional' sounding doctors to have a lower success rate. Assuming that 'anxiety' was a proxy for concern, it seemed that the more a doctor showed personal (rather than 'coldly professional') concern for a patient's welfare, and evidenced this in tone as well as words, the more likely the patient was to treat this as the start of a therapeutic relationship which they wished to continue.